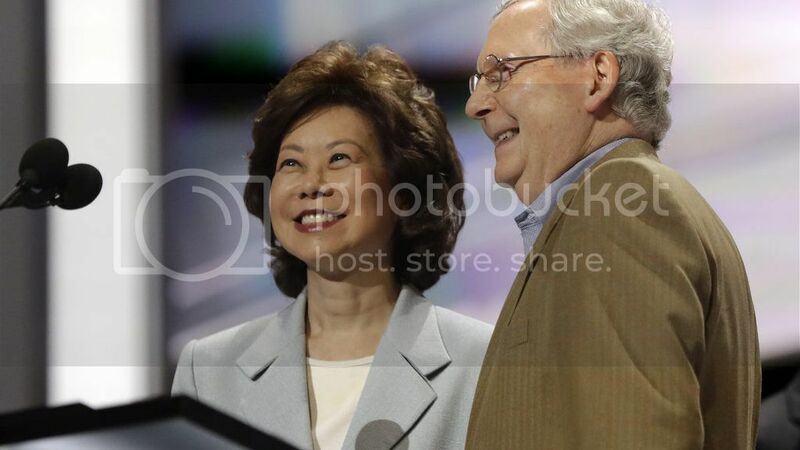 Four years ago, this dingbat woman who Obama appointed to head the FMCSA (Federal Motor Carrier Safety Administration) was pressured during Congressional hearings and persuaded to actually ride in a big rig with a professional driver for a few days to see what the actual business of interstate commerce is like. To her credit, Anne S. Ferro actually did it, and afterwards described it as "A SMACK IN THE FACE, very enlightening" and said it had given her "a much different and a much clearer view" of what trucking was really like. That's the problem with all these political hacks and 'swamp-dwellers,' they regulate businesses to death with all of tbese retarded and inane rules, but they usually don't know anytbing about the actual business. 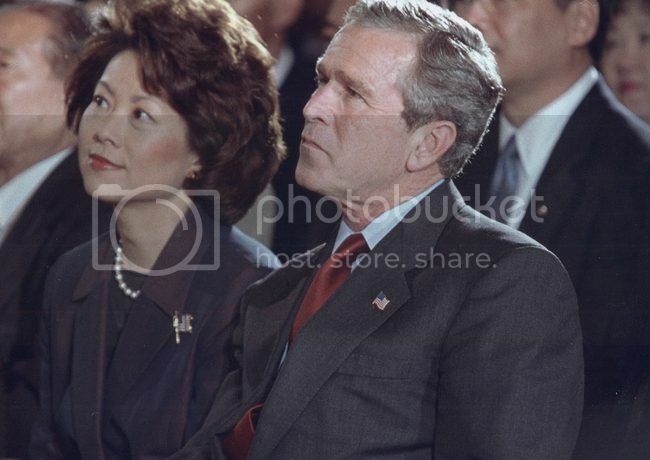 She is the consumate Washington insider, Senator Mitch McConnell's wife and two time federal appointee- George H. W. Bush's Assistant Transportation Secretary, and George W. Bush's Labor Secretary for eight years. So wbad'ya say, Elaine? Do you even own a pair of jeans or cargo pants? Ever been forced to eat Dennys and Arby's slop for days or months on end? Ever been to a weigh station? Waited at a consignee? How about the new absurd mandatory breaks and ridiculous hours rules that Obama put in? Will you repeal them? Any of them? Be sure to see the outstanding new LibertyFight.com Trucking Archives here. I am very proud of this collection. Anne S. Ferro, administrator of the Federal Motor Carrier Safety Administration has taken a ride-along with an actual trucker for two days and described the experience as a "smack in the face." She added that the experience has been "very enlightening" and has given her "a much different and a much clearer view" of the real life challenges that truckers face. Ferro, who was appointed by President Obama in 2008, has often been critcized and accused of being clueless about the industry and the real challenges drivers face. Particularly harsh was criticism concerning the new rules for breaks and re-starts which went into effect July 1, 2013. LandLine Magazine outlined Ferro's recent road trip in an article titled Administrator Ferro gets a fresh perspective on trucking during ride-along. Ferro travelled with veteran owner-operator Leo Wilkins, who has recieved awards for a 21-year safety record. They hauled freight on a flatbed truck, beginning in Marlboro, MD to Harrisburg, PA (119 miles) and then to Indianapolis Indiana, which is a pretty long day, 663 miles total from Maryland to Indiana. The next day, after Ferro spent the night in the truck's sleeper berth, the two travelled from Indiana to Riverton, Illinois (200 miles) and then another 112 miles to St. Louis International Airport. "I've been one of those people who have said a driver just needs to plan his or her trip, that they just need to plan better. Well, smack in the face to me, I think I'm finally getting why it's so hard to plan." "...The challenges the owner-operator faces are much more real to me as a result of this trip with Leo," she said. "It's not that I wasn't aware of that. I've certainly always known it in theory and from reality from conversations I've had, but experiencing it firsthand as a passenger gives me a much different and a much clearer view." ..."Leo took a hotel room so I could sleep in the truck," she said. "It is a lovely sleeping cabin. I looked at that and thought about what it would be like to be in a normal sleeper berth, and how difficult it is to change your clothes, how difficult it is to get fresh water, how you have to get up in the middle of the night or in the middle of your rest period to go to the bathroom at the truck stop if you don't have something like this accommodation; how little access you have to healthy food if you're in a regular-sized sleeper berth. So that has been very enlightening for me."